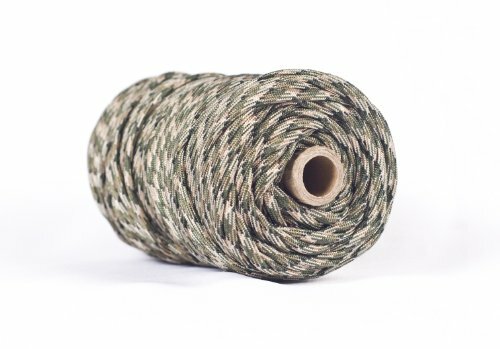 750 Pound Test Strongest Parachute Cord - 100% Nylon - All Our 750 Cord is Type IV Made to Mil-C-5040H Military Specifications. NOTE: The U.S. Military Does Not Currently Use All Available Colors. Great For Survival, Disaster Prep. and Projects Like Bracelets, Belts, Lanyards etc. True "Military Specifications" Doesn't Flatten-Out Like Cheaper Cord. All 50, 100, 200 and 500 Foot Lengths Are Guaranteed Continuous. 1000 Foot Spools "MAY" Have Up To (2) Non-Spliced Sections. 50 and 100 foot lengths (And Tri-Packs) Come Loosely Coiled in Sealed Bags... 200 Footers Come on Tubes, 500 and 1000 Foot Lengths Come on Spools and are Shrink-Wrapped. Click Images on Left to See Even More Images and Examples of Packaging. – Ideal for Emergency Bracelets, Emergency Climbing, Belts, Wrapping Tools, Lifting, Backpacking and Towing Moderately Heavy Objects. – Great for Camping, Hiking, Gifts, Home Fixes, Cabins, or Bug-out Locations. – VERY Portable – Put it on your wrist, belt or in your pack etc. Our 750lb Paracord is very lightweight and easy to take with you! 200 Pounds Stronger and TRUE Military Specifications! If you want the best parachute cord available… that is also made in the USA by a government certified manufacturer, you are in the right place. American made quality by a company that has been supplying the US government with parachute cord for more than 100 years! Don’t accept cheap foreign imports!!! – You can braid it into bracelets or belts or just use it for great holding power. – Since it is 200 pounds stronger than 550 paracord, you’ll have greater confidence when you really need it! – Tough-Grid Paracord is a “must have” for your emergency preparedness supplies and makes a fantastic gift!